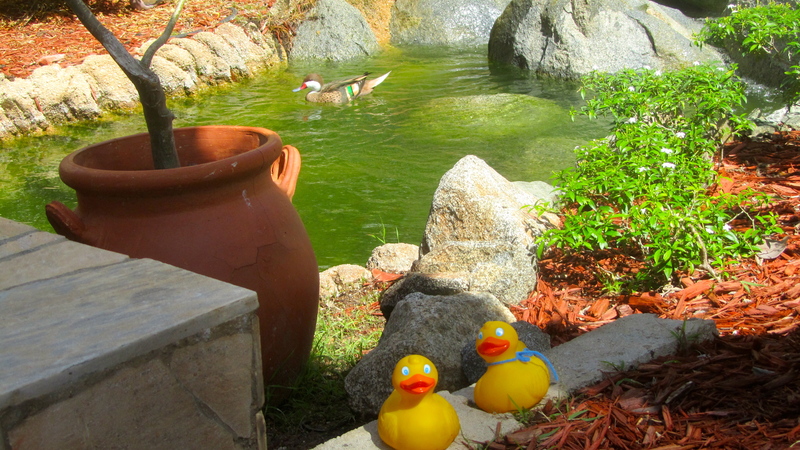 Last day in Aruba and we checked out of our condo. They will store luggage until we need to go to airport for late afternoon flight. 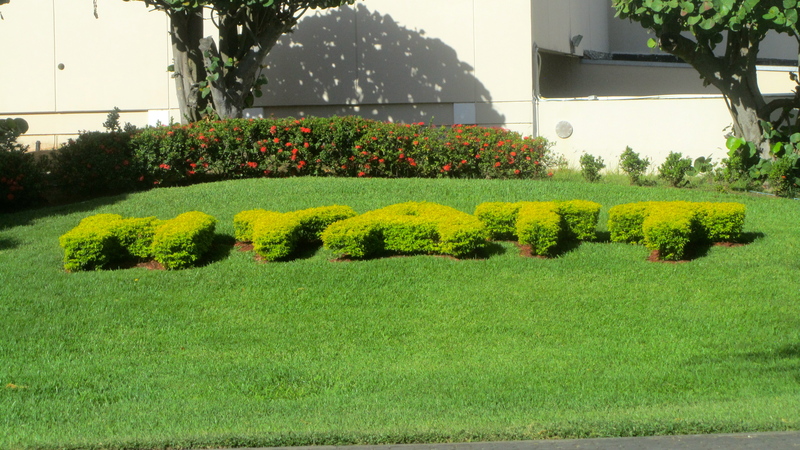 A cab driver suggested we enjoy the gardens at the Hyatt. We did that. One evening during dinner at a Hyatt beach bar and grill, Soapy’s mom got hiccups. 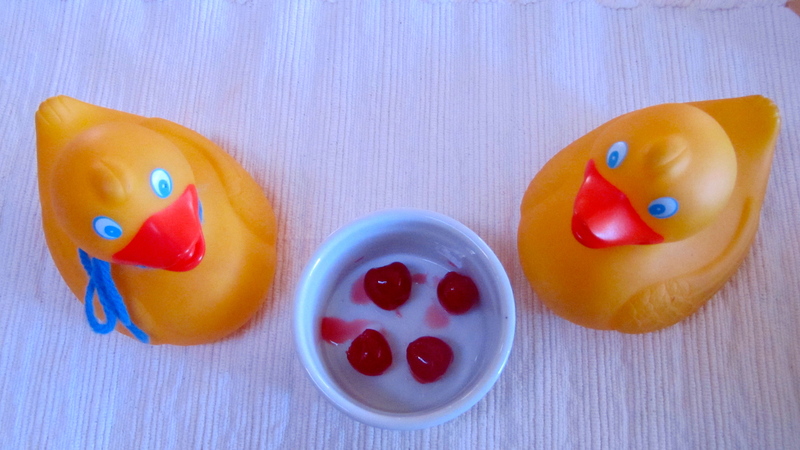 Without a word, the waiter presented her with a small dish of maraschino cherries. He suggested that she eat all of them rather rapidly and hiccups should stop. She likes the cherries anyway, so she ate them and hiccups were gone. Something we will remember in the future if they return. 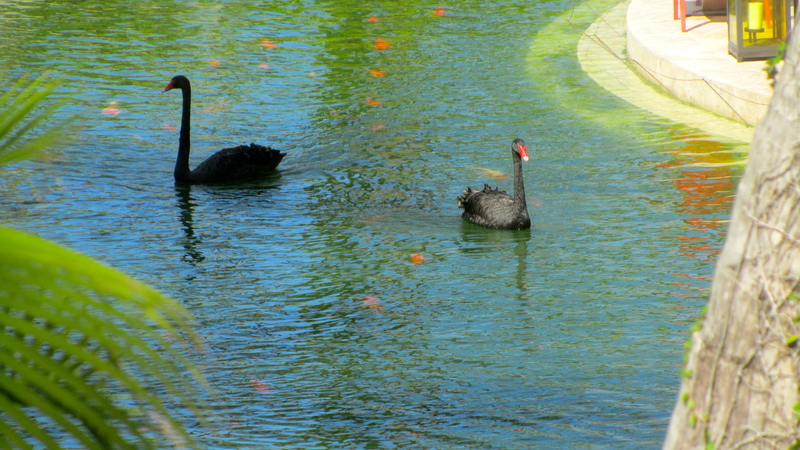 Today we admired the black swans. They are wonderful. 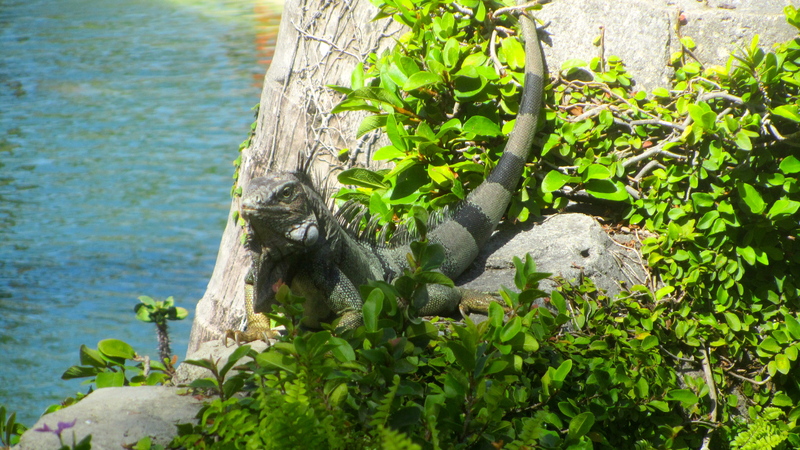 Since this is a tropical garden, this iguana joined us. Also, we found whiptail lizards. 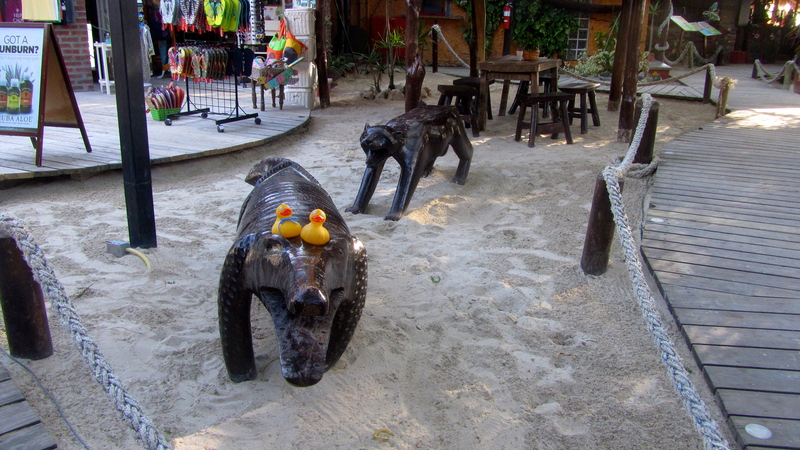 Zeb and Soapy were happy to pose in front of another distant relative. 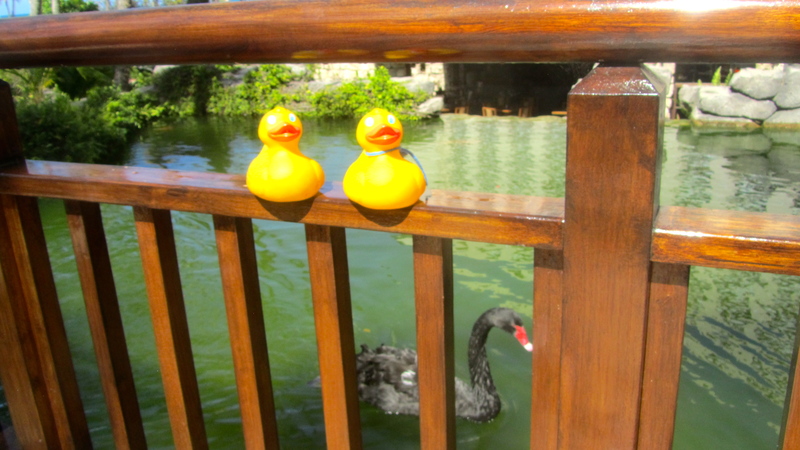 Our moms really liked the black swans swimming with the goldfish (or are they carp). Here is a glimpse of the garden and river. Our moms could not get a good photo. 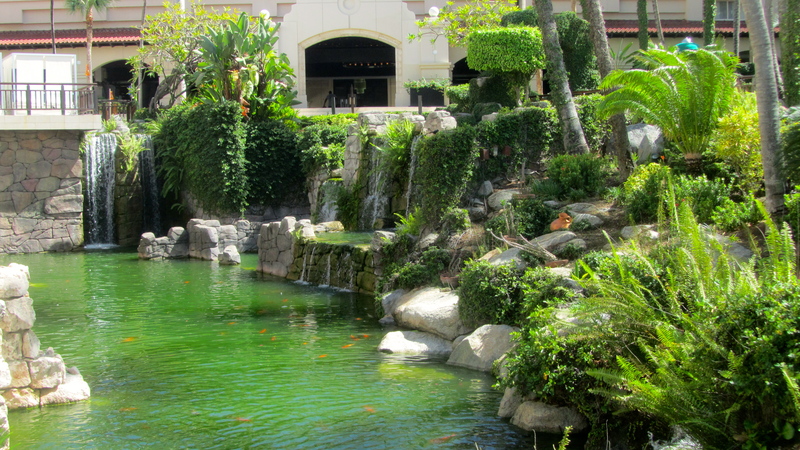 Gardens are very extensive and create a wonderful oasis in this tropical paradise. We stayed on the beach for a while, enjoying the water, sun and sand and beverages. 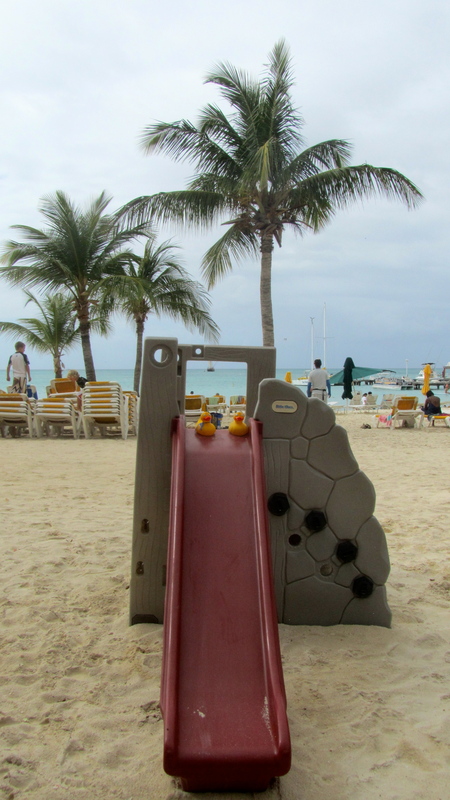 We will miss Aruba, but hope to see you there next time we visit the island. and glimpsing the Caribbean we enjoyed the drive. 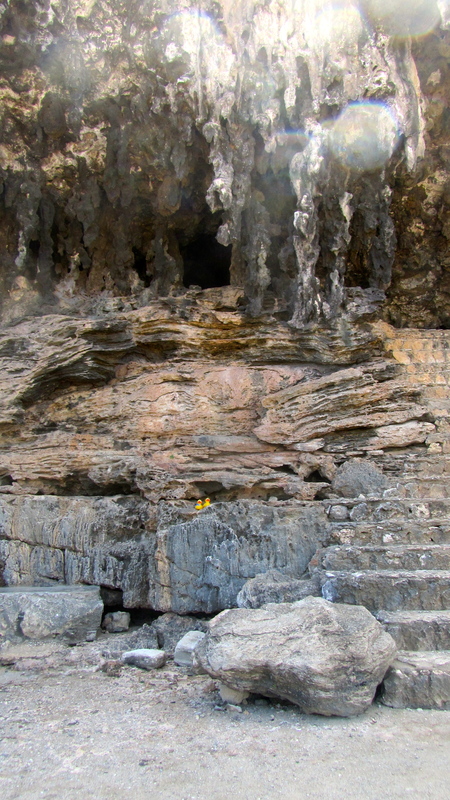 Climbing the rocky stairs to enter the cave, things became much darker. more smaller openings led to other parts of the cave complex. Venturing through another entry, we soon discovered an even larger chamber with sunlight streaming through an opening, like a natural skylight. Our Quadirikiri cave and sunlight produced some beautiful colors. Stalactites and stalagmites were forming in our cave. 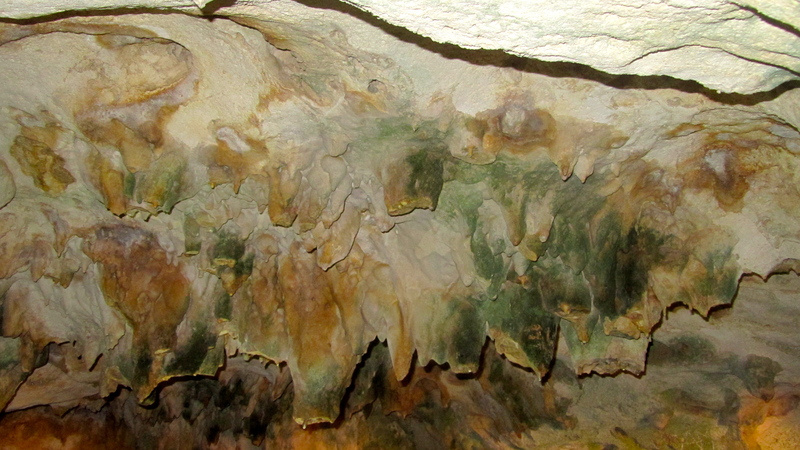 Stalactites grow from the ceiling and stalagmites appear to grow from the floor. They are formed by dripping water and grow approximately one inch per hundred years. Very slow. After hundreds or thousands of years the stalactite and stalagmite reach each other and a column is formed. 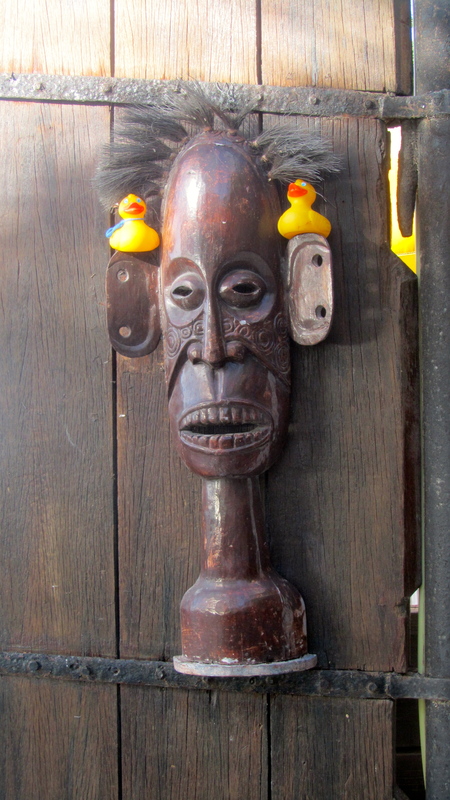 Zeb and Soapy Duck are by a column. We were very careful so we did not touch or damage this column or anything else in the cave. 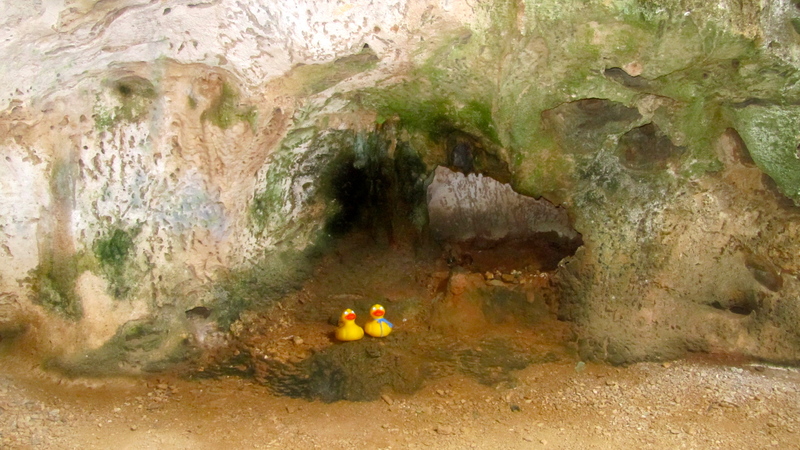 We were not alone in our cave traveling. 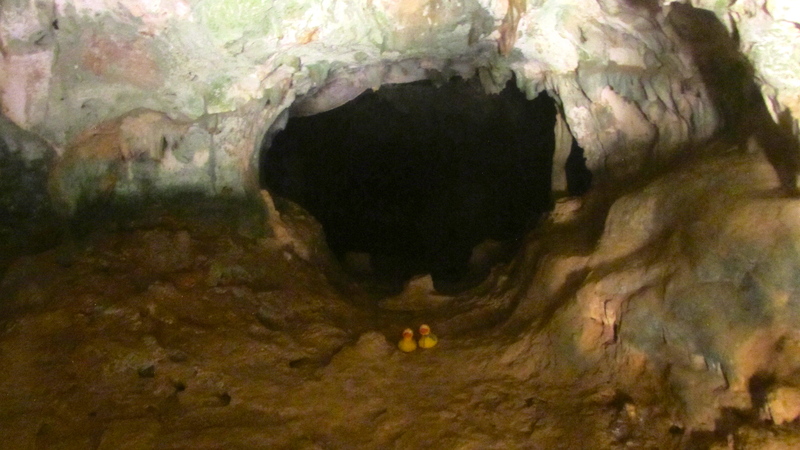 Hundreds of small bats also travel in these caves. They flit around the 98-foot cave area to reach their nests deeper in the cave. Our guide told us the bats are not dangerous. They prefer berries (some from the cactus) and insects over our blood. No vampires here. That was good to know as we entered their home. The bats especially do not bite or eat traveling ducks! 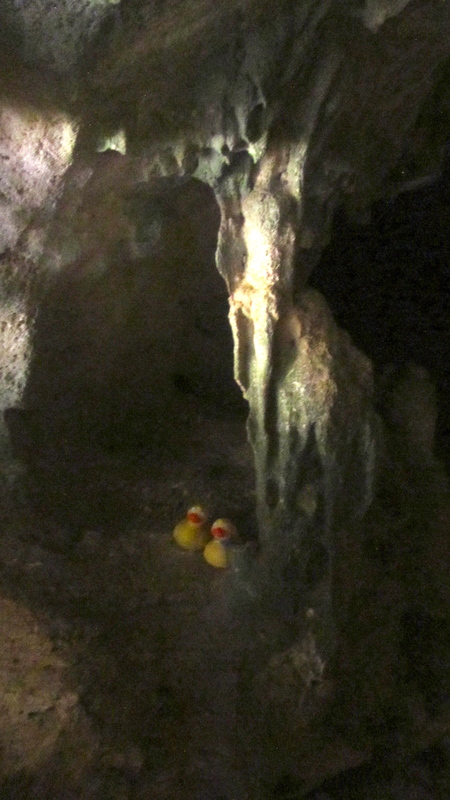 We ducks liked the cave, our first, and we think you would like it also. 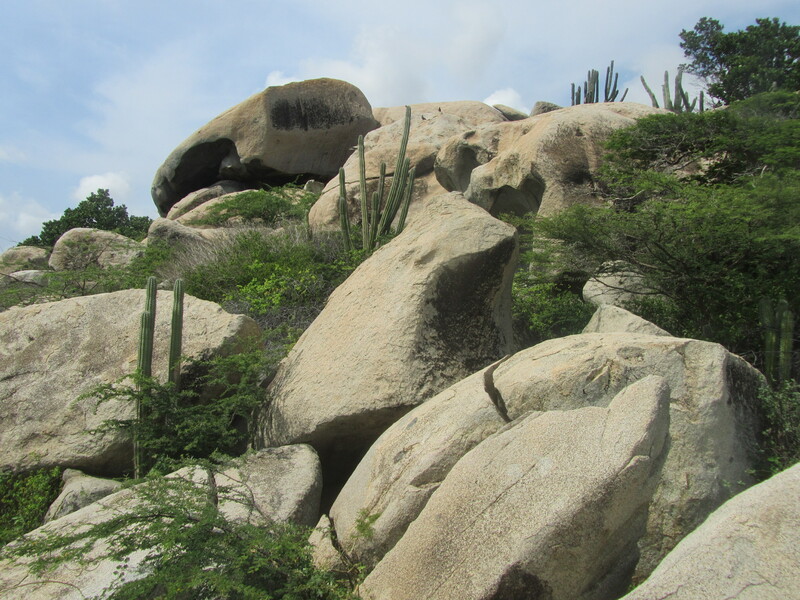 This cave is on the southern Caribbean island of Aruba inside Arikok National Park. Let us know if you like caves. 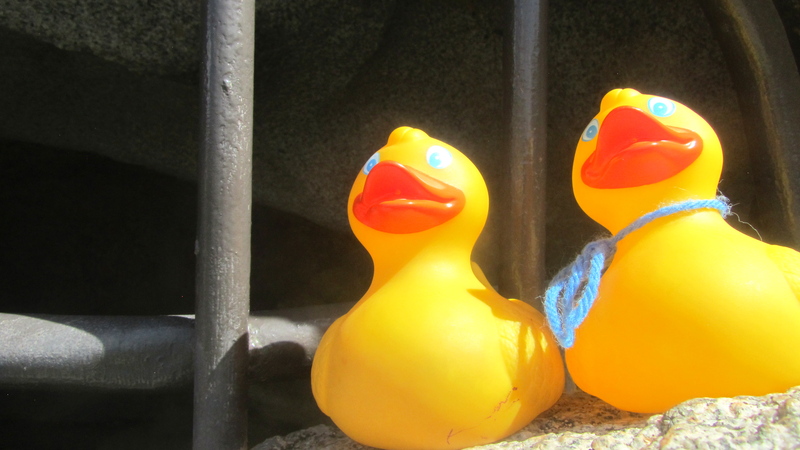 Soapy and Zeb Duck are going on a sailboat. A sunset cruise for us. This trip will be different. We are not having dinner on the boat, but there is a rope swing. A rope swing??? This is new to us. We arrive at the beach with our moms. Our first job is to find the Jolly Pirates office. Reservations have been made, but we need our boarding passes and they need us to pay. Look at this. She is by the Jolly Pirates building and she is hot. Yikes! OK, we have the boarding passes, so now we go to the pier and wait for the shuttle boat to take us to our pirate ship. This is a great pirate ship. 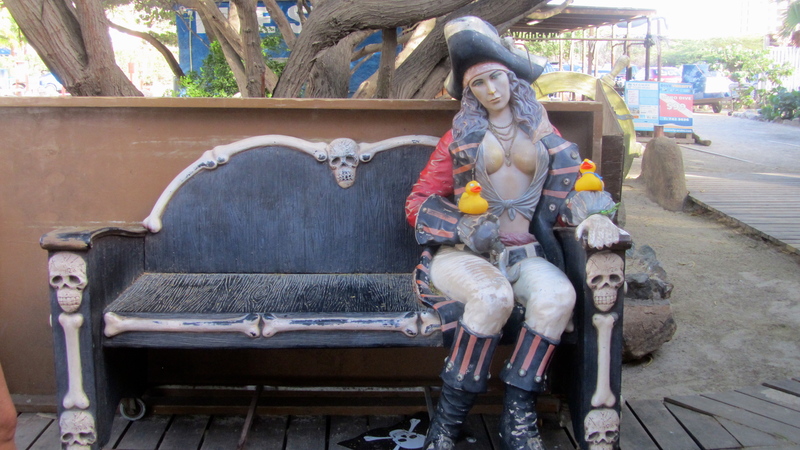 On the pirate sailboat, we sit in the front. Great view and refreshing sea breeze. A sailor asks about our drink preference and soon our beverages arrive. We sail along Palm Beach, heading toward California Lighthouse. 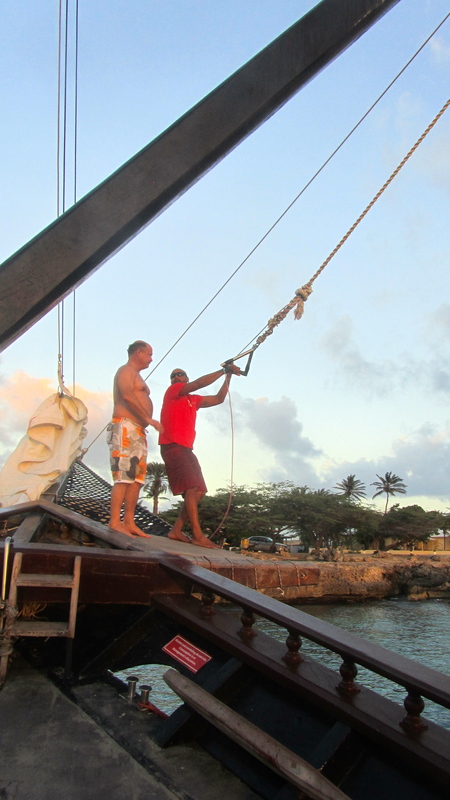 We put down the anchor and now it is time for the rope swing. and soon humans are lined up to hold on to a rope, swing out over the water and, most importantly, remember to let go of the rope before they swing back into the boat. And, many humans do this rope swing several times. It does look like a lot of fun, but we ducks could not climb the ladder to get back in the boat. Some things are just for humans. Soon everybody is talking to everybody else and cheering those doing the rope swing. And beverages keep coming. This is a great cruise. The gold sky of the setting sun was spectacular. Every human seems to be having a good time. Soon it is dark and time for us to return to the shore. 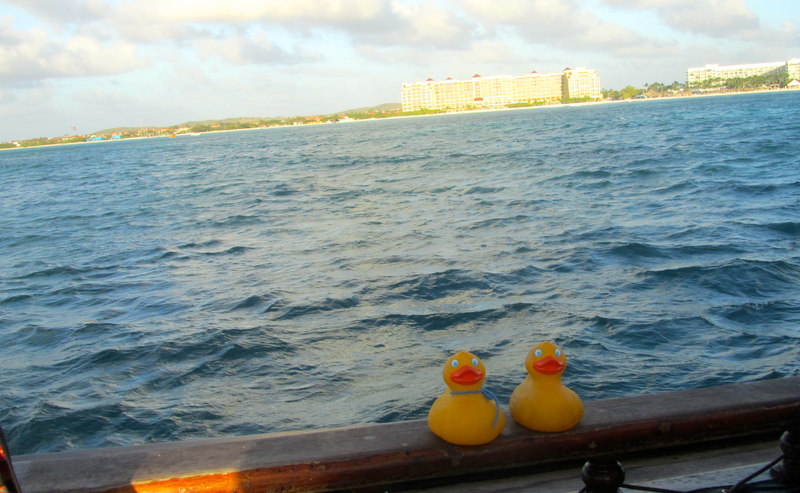 Ducks and humans liked this boat trip. When traveling be open to new experiences! Always time for a little shopping. we are ready to visit the California Lighthouse. or coral in the roads. 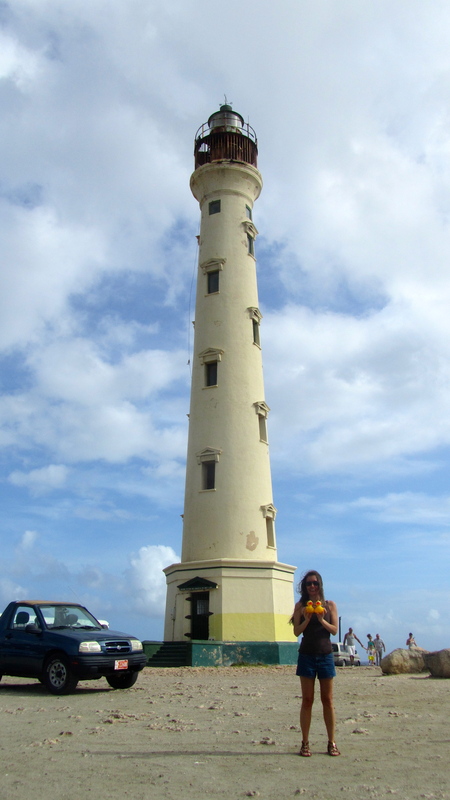 California Lighthouse was built to warn sailors about Aruba’s treacherous coastline. 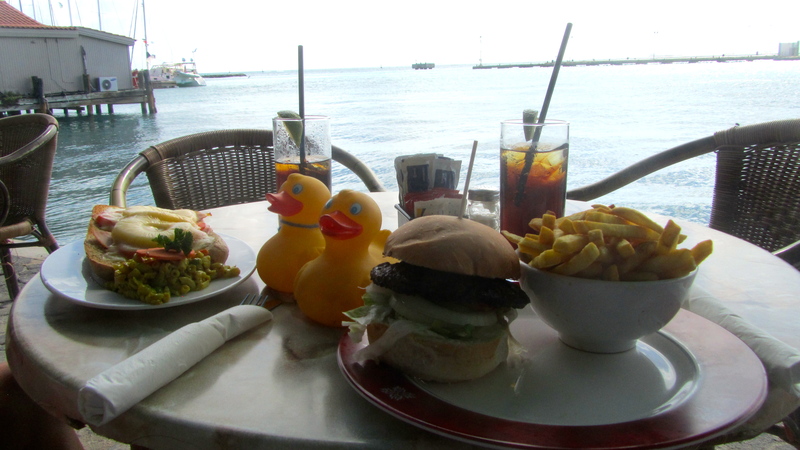 There is a great restaurant here and nice views. We are not hungry yet, so no restaurant visit now. But we did try a coconut smoothie. Made with fresh coconuts while we watched. 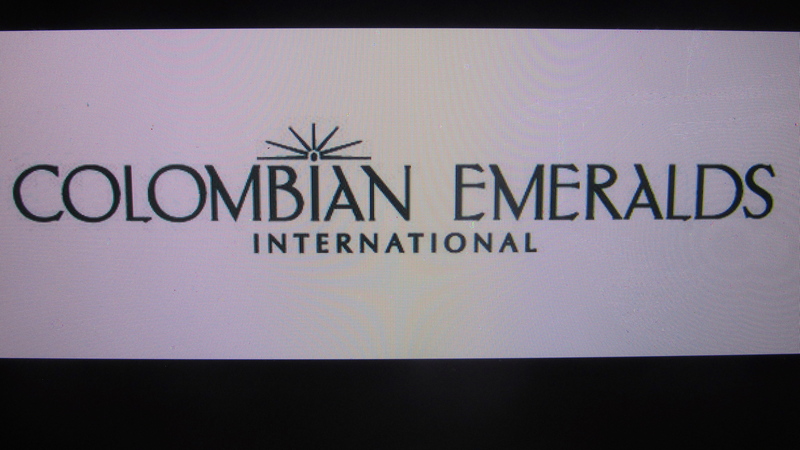 in Colombian Emeralds, for a long time. After a quick trip to the cash register, we left the store. Moms were smiling and looking at their hands. A new emerald ring today. It is pretty. Guess shopping makes humans hungry; lunch at the Paddock today. This is a great restaurant! 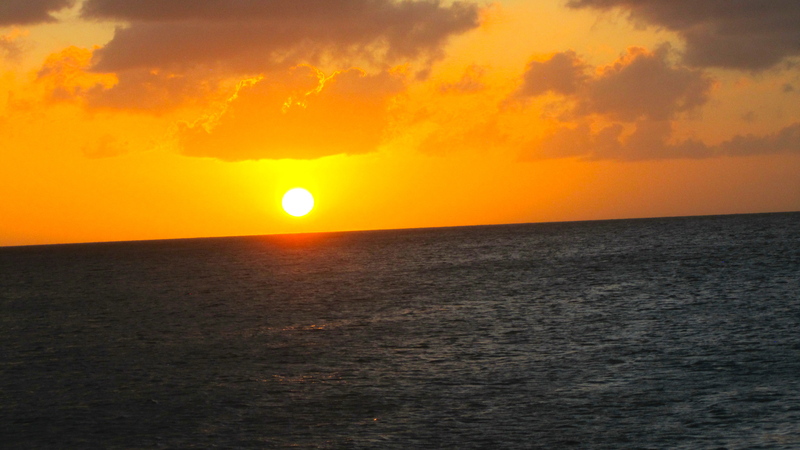 We sat outside on the deck, right by the Caribbean. 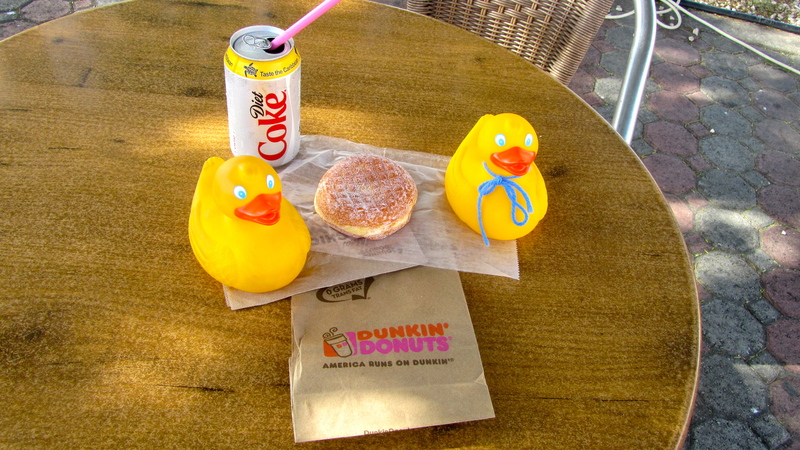 Lots of food and several diet Cokes came to our table. Yum!! But, we were not alone. 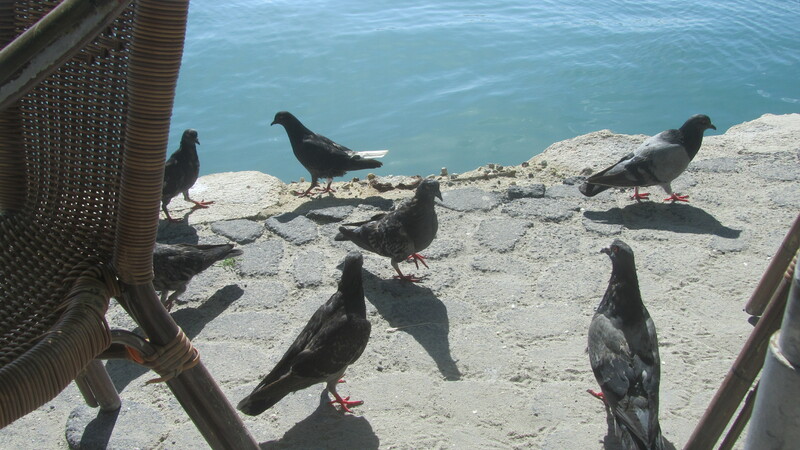 These pigeons are hoping for a snack also. Too bad we don’t have a warm ocean in Colorado. This is fun! After lunch, we walked round town, admiring so many things. Iguana Joe’s place has this iguana. Climbing up the post to get nourishment. The mom’s enjoyed this shopping area also. and then to the beach. 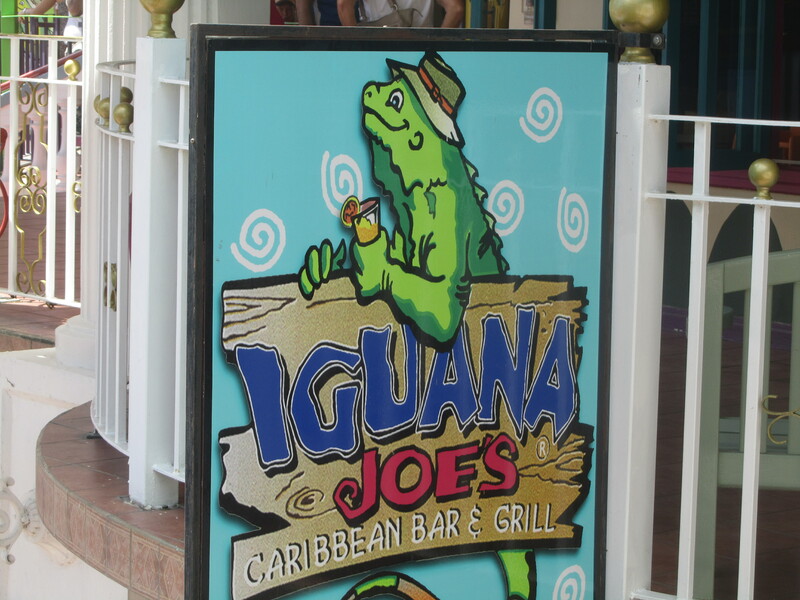 We are on the iguana’s hand. 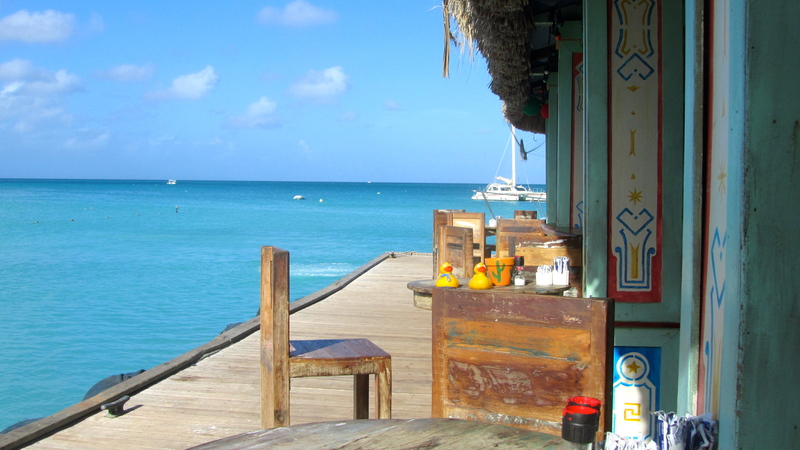 We like everything about Aruba. 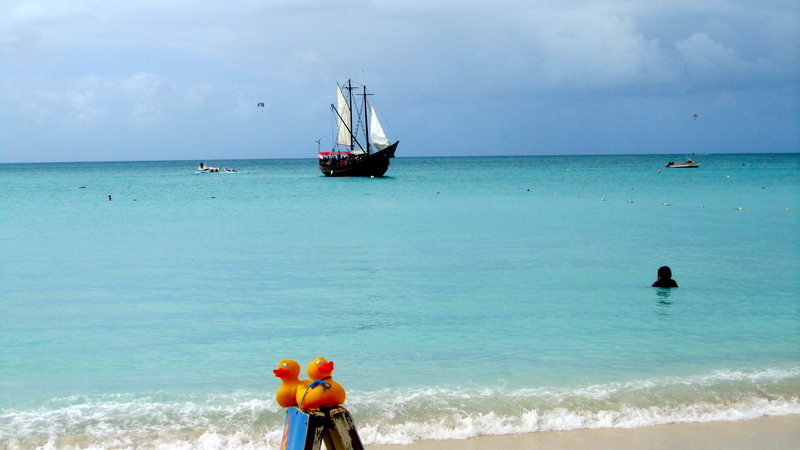 Stay with us for more Aruba adventures. Zeb and Soapy heard the moms talking about a sunset cruise. Come with us! 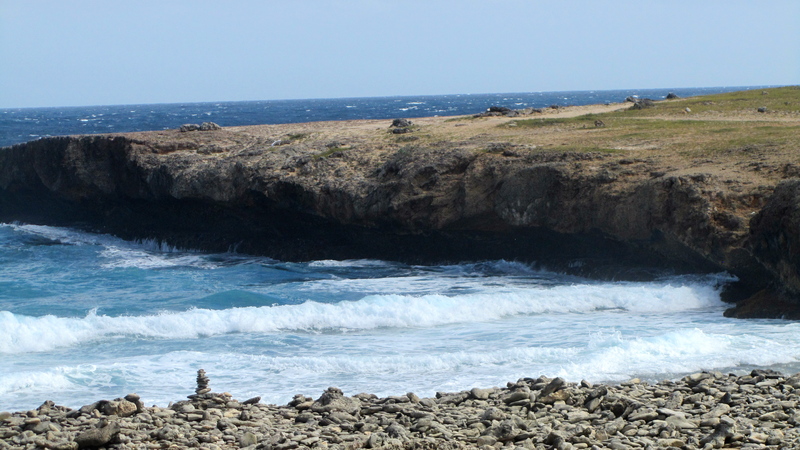 Pounding waves, sea spray and wind dominate the north shore of Aruba. 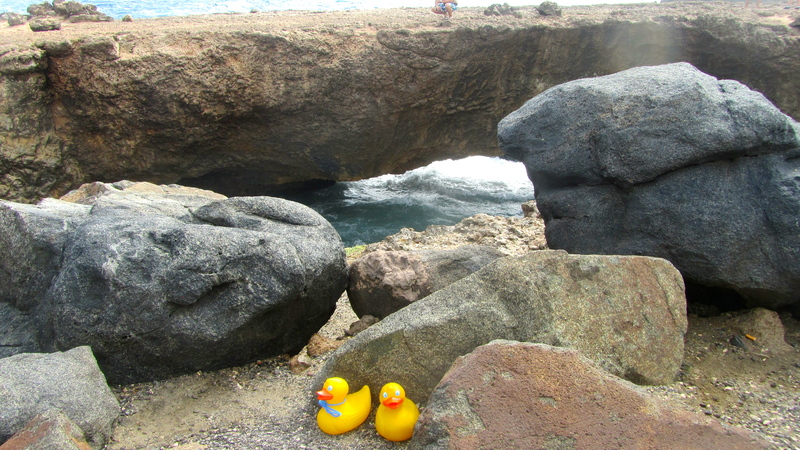 The crashing surf erodes some rock and centuries later natural bridge was formed. The relentless pounding continued and natural bridge collapsed in September 2005, fortunately during the night. The pounding and force continue and Baby Bridge is forming, beautiful in its own right. but we spent much of our time watching crashing waves. There is a refreshment area and a nice gift shop. Also, a clean restroom is available for $1.00. They must pay for water to be brought here. 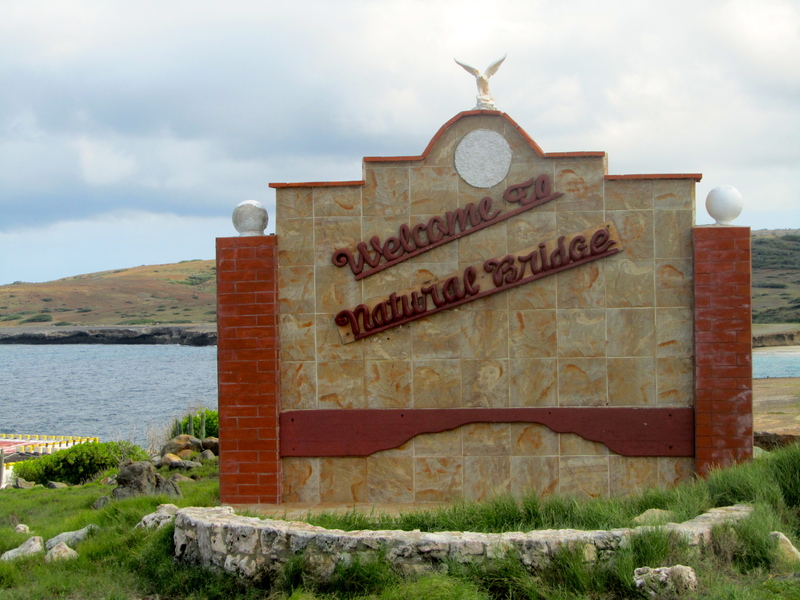 There is no admittance fee to Natural Bridge. We liked natural bridge area. Approaching Natural Bridge from Alto Vista Chapel, our guide showed us an inlet where local residents had fed sharks. They are not allowed to do that now, so we did not see sharks here. Continuing our tour, Ayo Rock Formations were next. 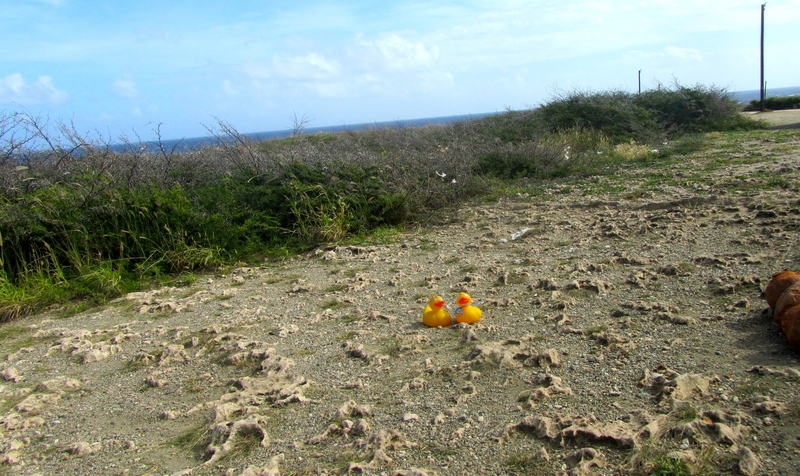 The Arawak, Aruba’s early residents, considered this a sacred place. 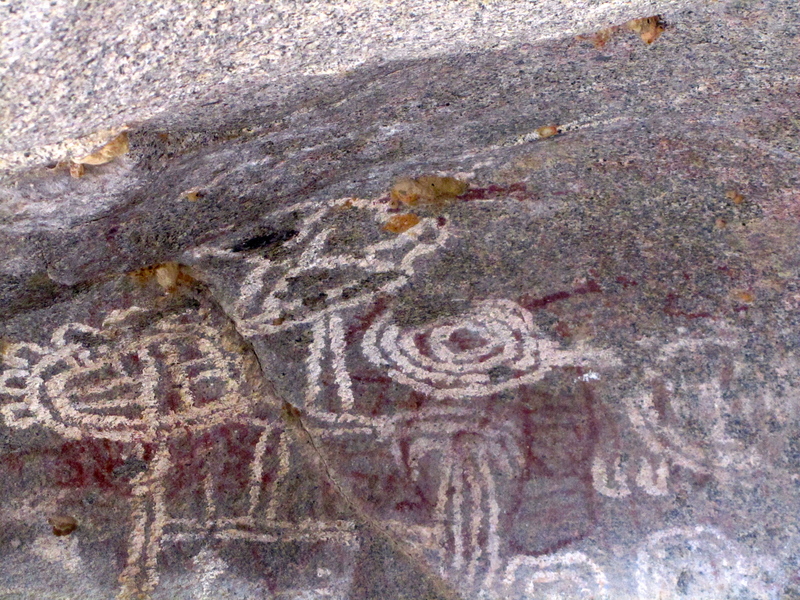 We saw these drawings in a cave. These boulders are huge and their placement a mystery. 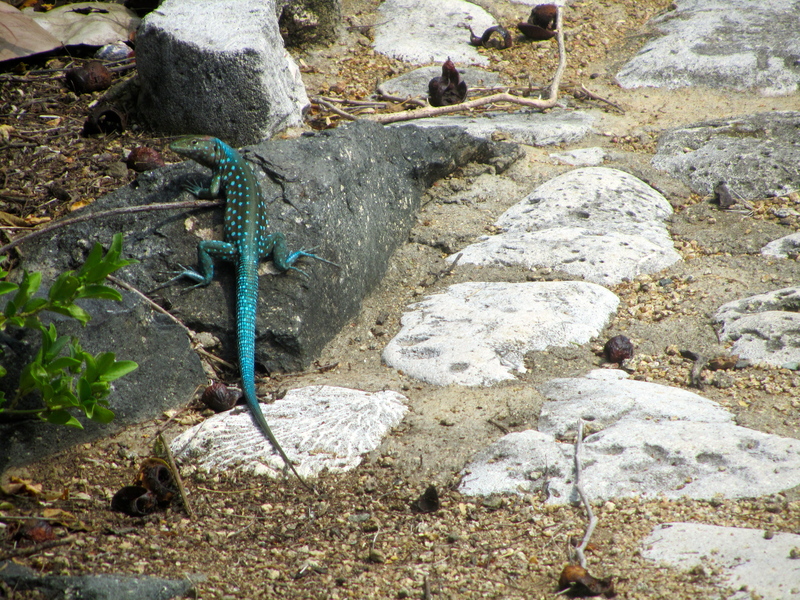 Ayo Rocks are home to several whip-tailed lizards. 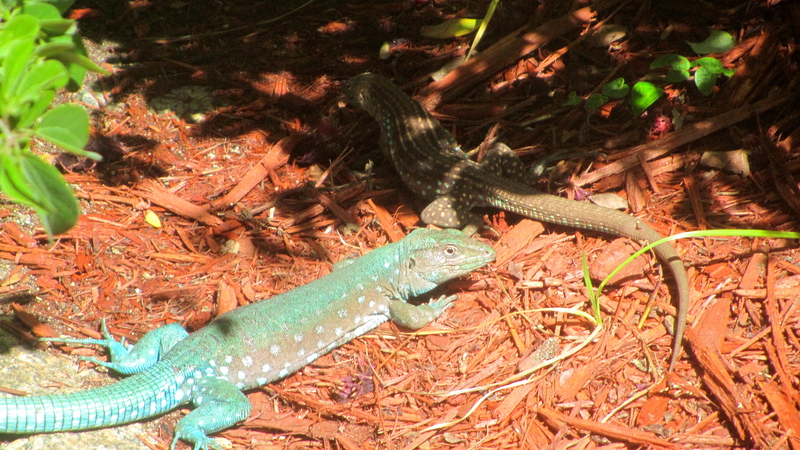 The males are cobalt blue and the females blue gray with light blue dots. Very colorful and very fast. 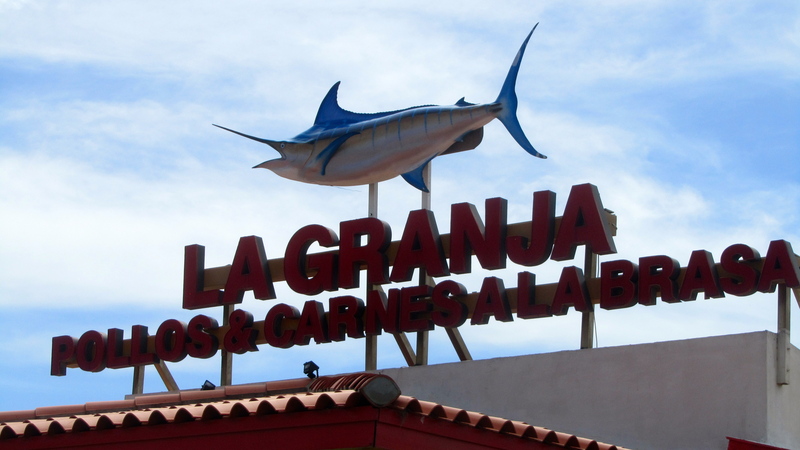 Continuing to Savaneta on the calmer coast, lunch was provided at La Granja Peruvian Restaurant. Lunch here. Chicken, ribs and rice. Chicken, ribs, rice and a drink. Very tasty and the service was fast and friendly. We would definitely go back. Soapy’s mom got a little crazy and put us here. but we did not swim here. We walked to another area to watch the pounding surf again. We will swim at MooMba Beach tomorrow. This was a great tour and our tour guide Victor was very knowledgeable and nice. 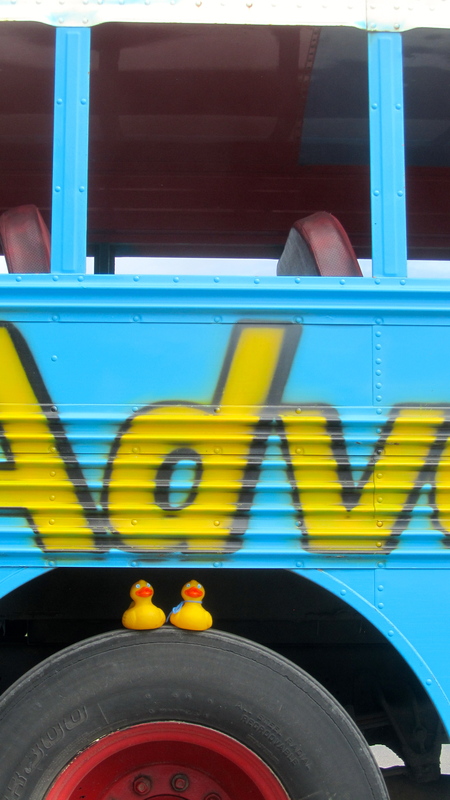 Visit him in Aruba at Tour Pelican adventures or www.pelican-aruba.com Let him guide you around this diverse island. 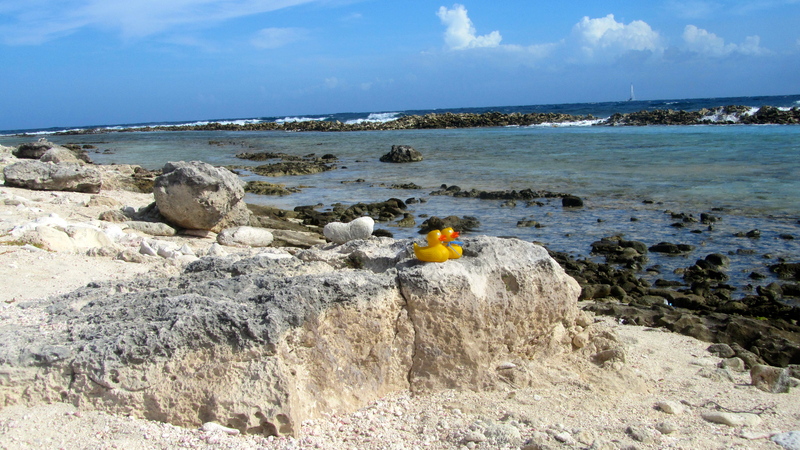 Touring Aruba, Zeb and Soapy Duck left the paved roads and headed toward Alto Vista Chapel. Approaching the chapel we spotted white crosses beside the road. These did not look like crosses honoring people who died in accidents along the roadway, and they are not. These crosses represent the Stations of the Cross. During Holy Week, the week before Easter, residents and tourists come here to live their religion and respect its meaning. The Alto Vista Chapel was rebuilt on the site of the first chapel. The original was built in 1750, abandoned in the 1800s and rebuilt about 200 years later. 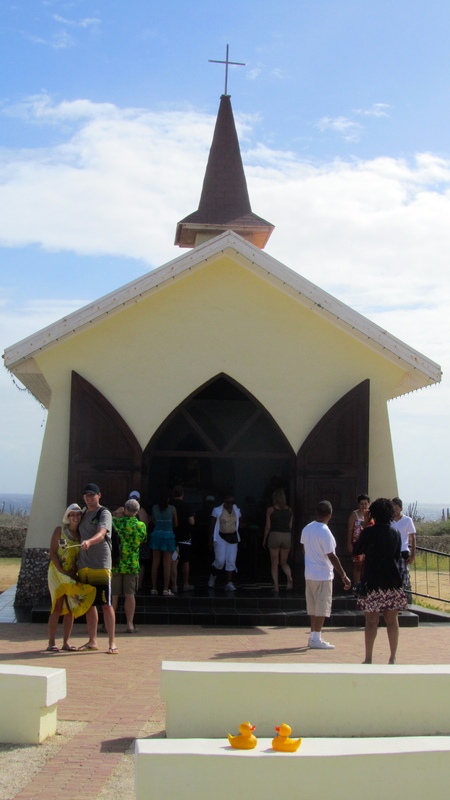 The original chapel was built before Aruba had a priest. 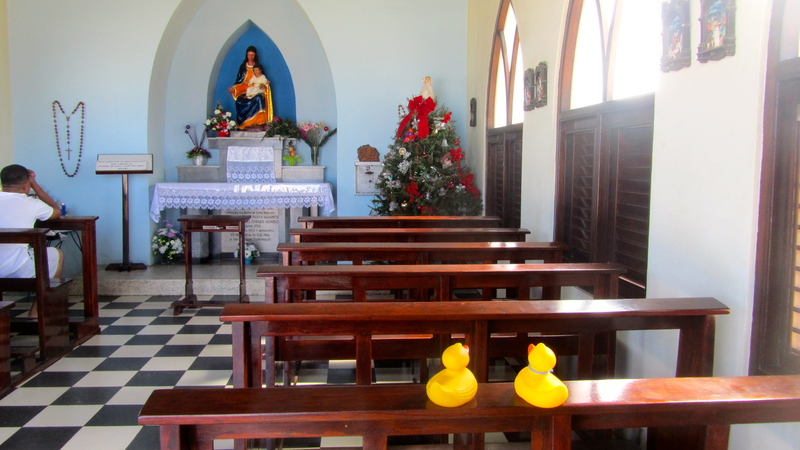 This yellow chapel is very peaceful, situated amid cacti and near the pounding Caribbean coast. 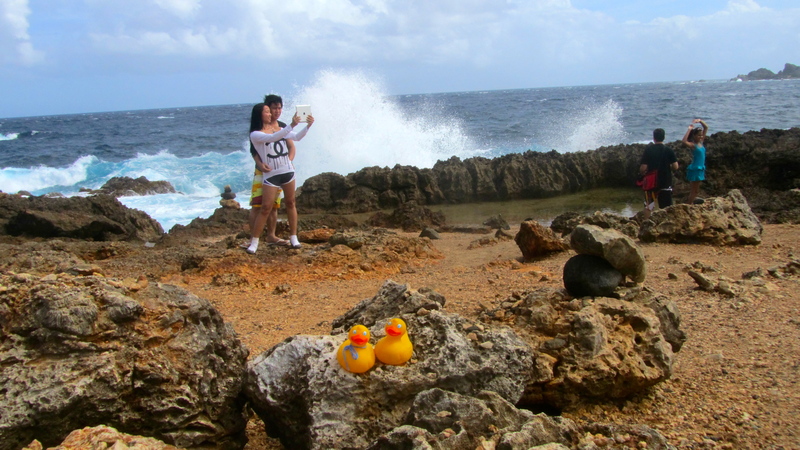 The northern shore of Aruba has rocks, granite and lava and is shaped by the fierceness of the water. 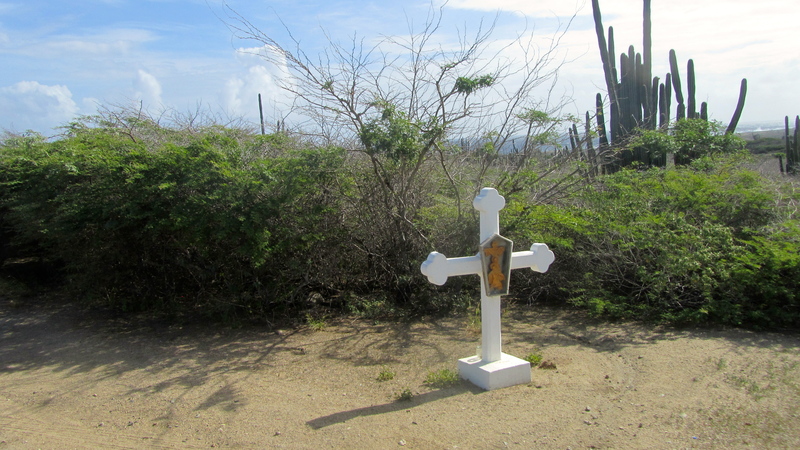 The Spanish cross of the Alto Vista Chapel is one of the oldest European works of art in Aruba. The small chapel, with its beautiful altar, has a loyal following of worshippers. We ducks thought the location was very serene. The humans were subdued and reverent here. We felt good at this chapel. Continuing on the dirt road we viewed something else. 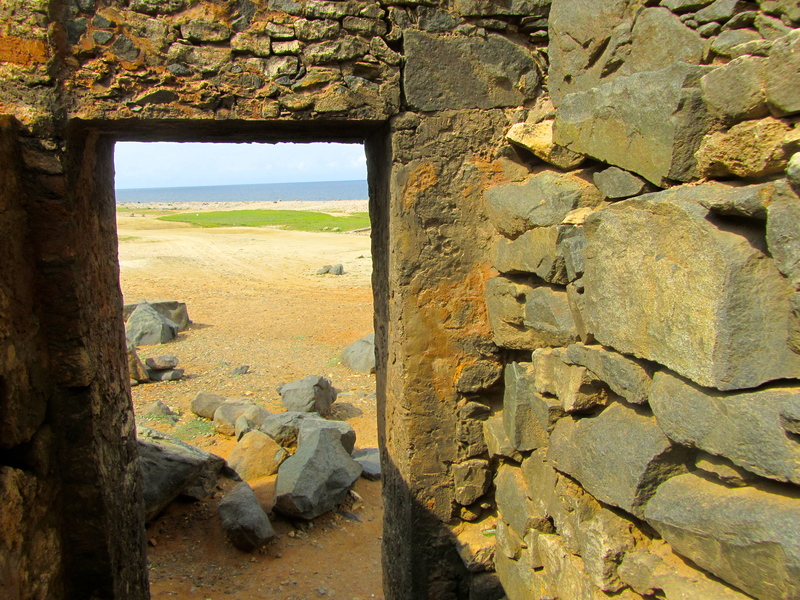 This was the Bushiribana Ruins. A 12-year-old boy found the first gold on the island in 1824. 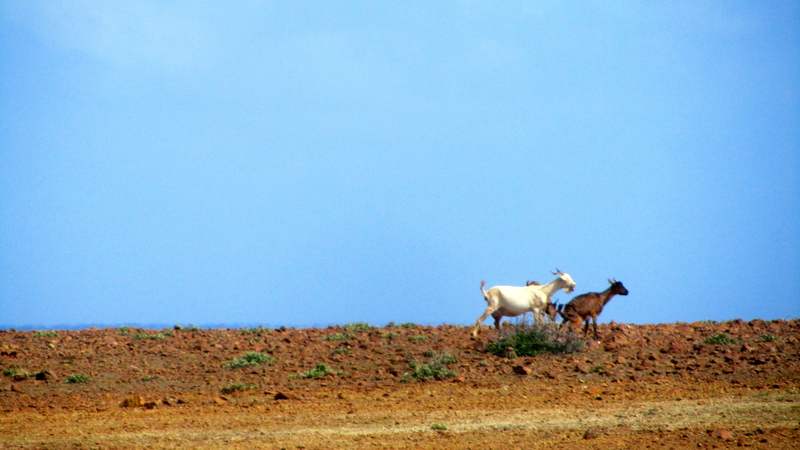 This started a gold frenzy in Aruba. For about 30 years local people found gold and sold it at a fixed price. A nice second source of income for them. 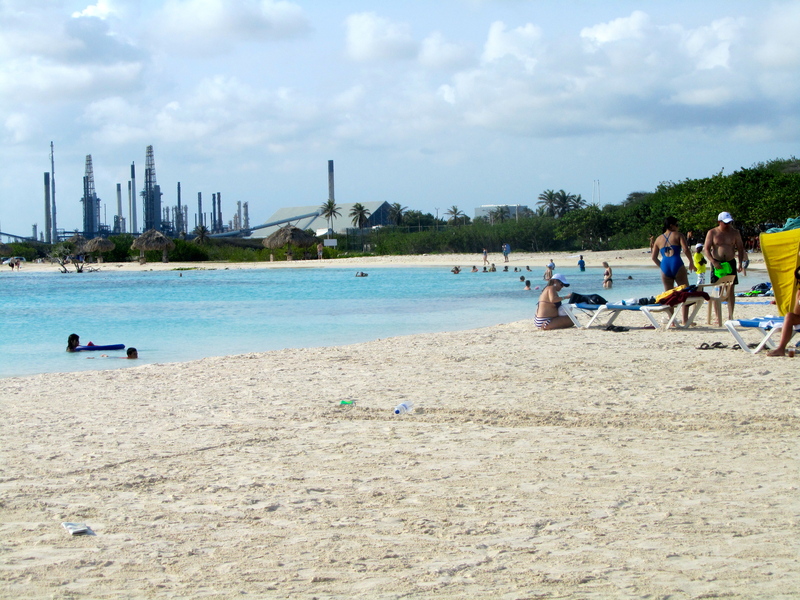 In 1854 the gold mining concession went to Aruba Island Goldmining Company. 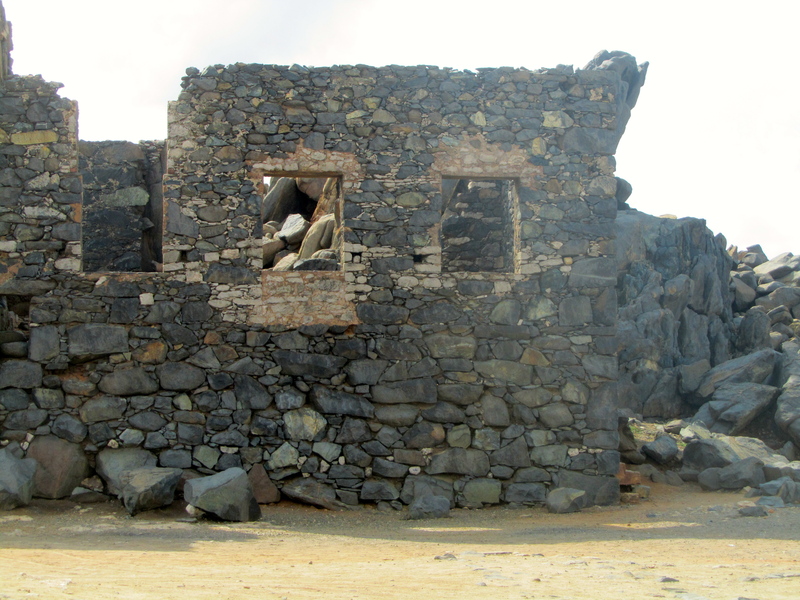 A smelter was built and operated for 10 years. The gold ran out, the smelter ceased operation and is now in ruins. 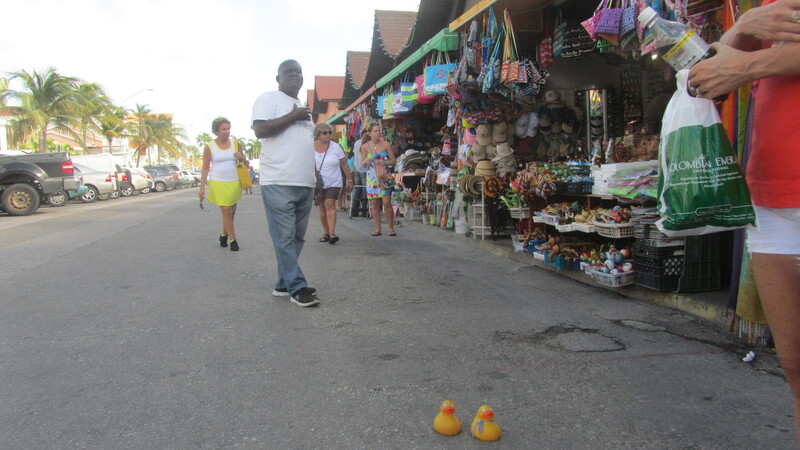 Our guide said that now we, ducks and tourists, are the gold of Aruba. 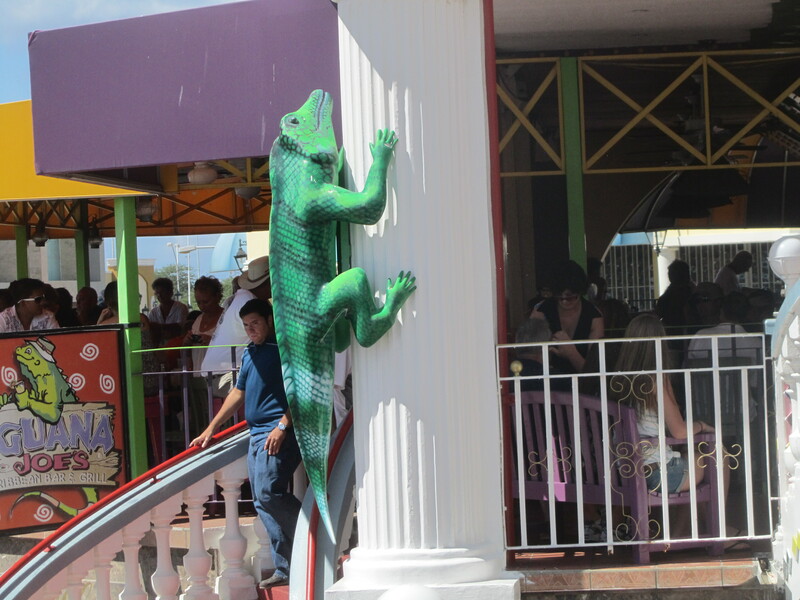 We like our tour of Aruba. 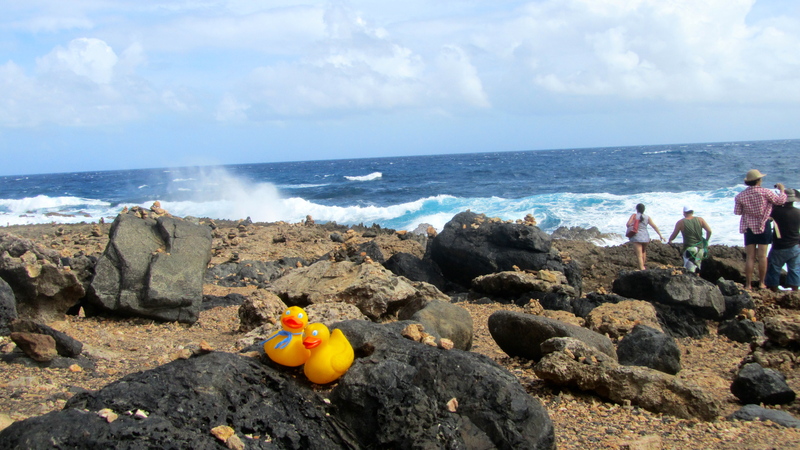 Next we are heading to the rugged north shore of Aruba. Pounding waves, here come the ducks. Palm Beach and MooMba Beach had our attention most days. 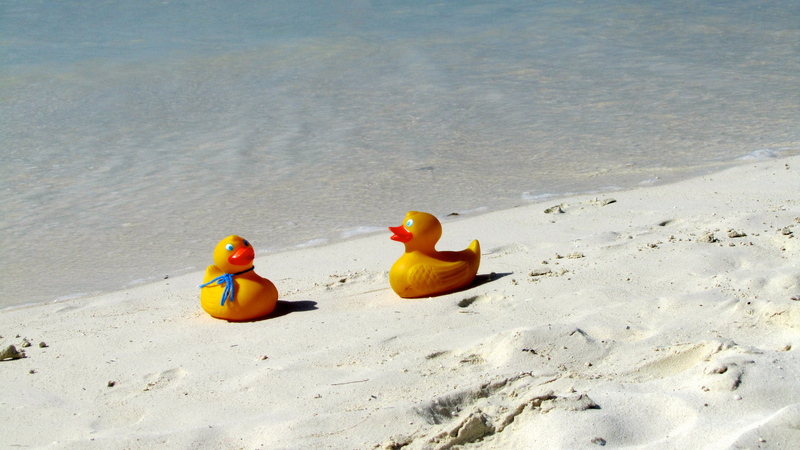 Our moms and we ducks love the beach. The sand here is so white and so soft. It is like walking in soft powdered sugar. There is so much to do here. We did not do it all, but we want to show some options. 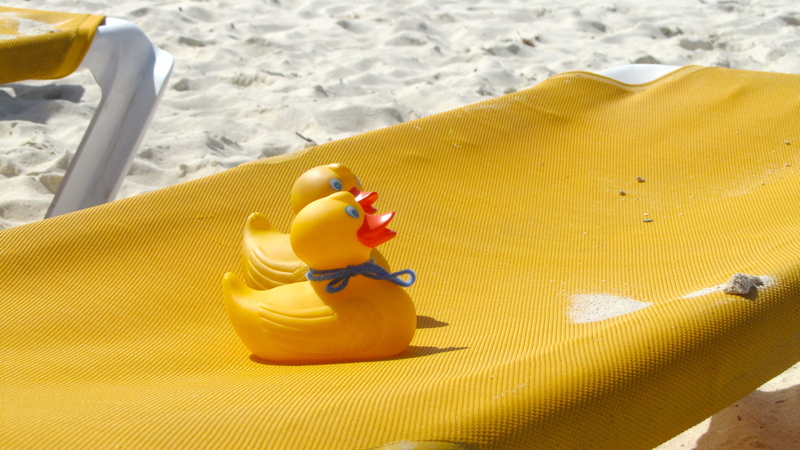 Our favorite is to relax on a beach lounge chair and watch the water. Moms did some reading on the beach also. Zeb and Soapy watched everything and everybody. Fascinating place! This was a new beach activity to us. As the day progressed, she seemed to get better and get higher out of the water. Earlier in the morning there was more falling. Maybe this is new and she is learning and will teach tourists in a few days. 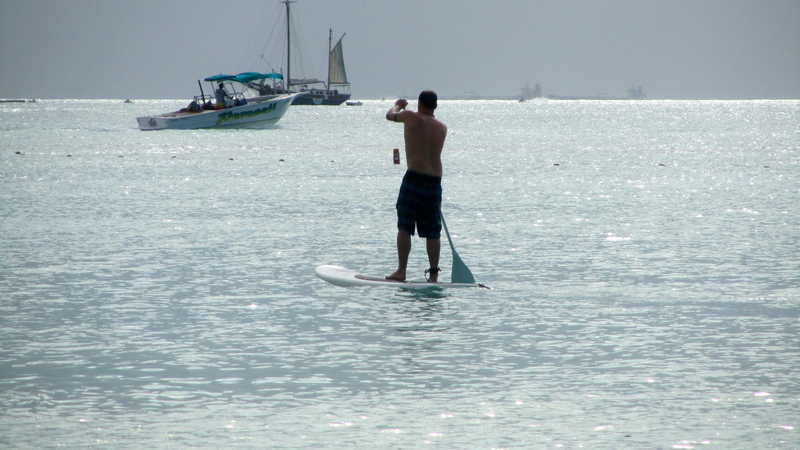 Stand Up Paddle boarding was rather popular. We talked to ladies from Long Beach, California and they paddleboard in California and love it. It is a great core workout. 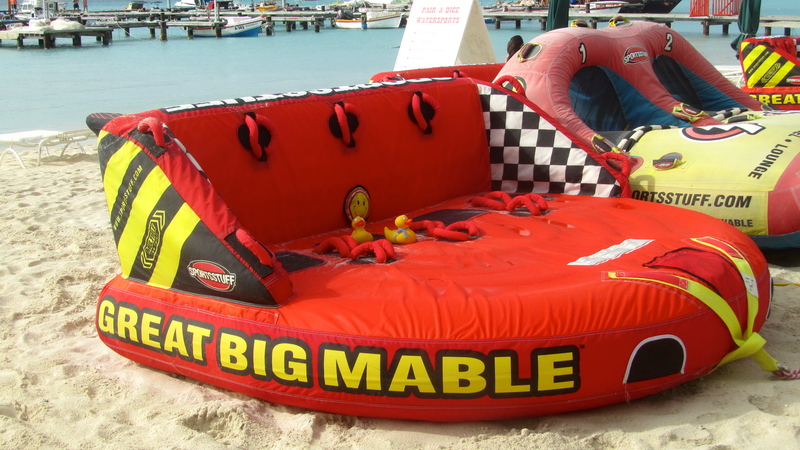 Here is Great Big Mable. Sit here and a boat pulls you in the water. Looked fun and humans were laughing and sliding all over this chair. 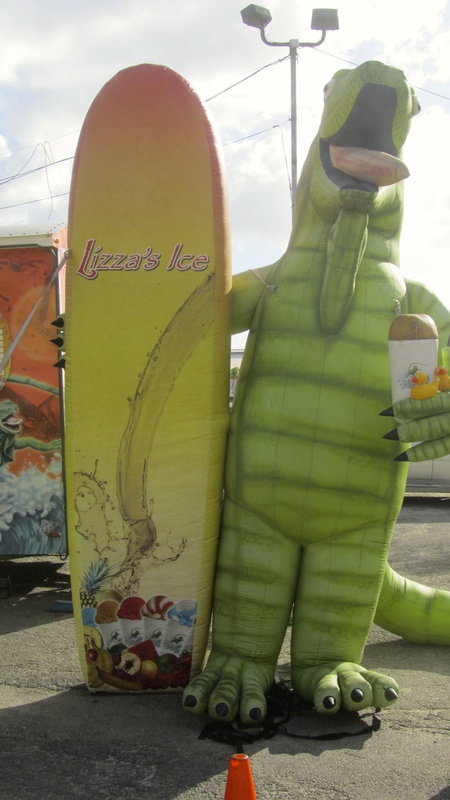 Also available were jet skis, the banana (pulled behind a boat), parasailing, and many boat trips. 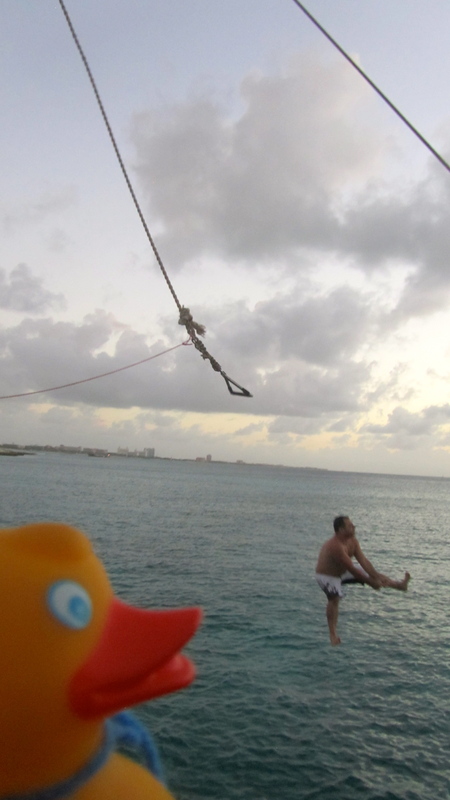 Many scuba and snorkeling trips are offered. Our moms did those when they were here before. 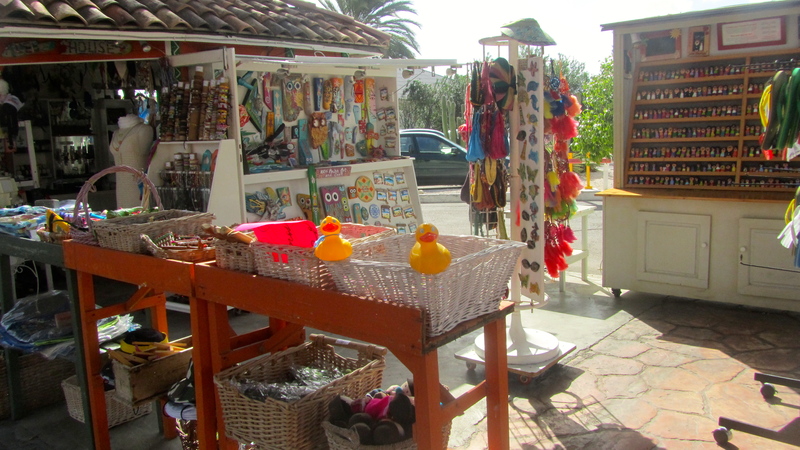 near shopping and beach bars. This mask was cool. Later in the day, after the sun goes down, many humans gather here to play beach tennis. One evening we enjoyed dinner on this pier and watched the sunset. Later we listened to the band play. Zeb and Soapy really liked the cute lady singer. Our moms thought she was good also. 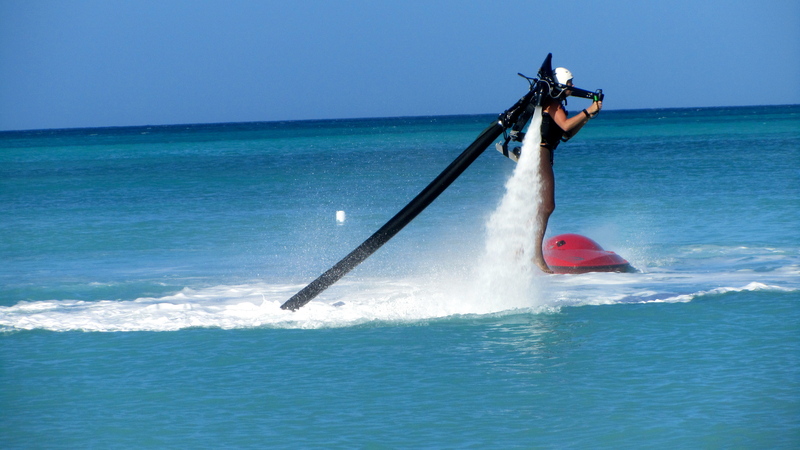 Palm Beach and MooMba beach have so many activities. If you like things quieter, perhaps Eagle Beach would be for you. 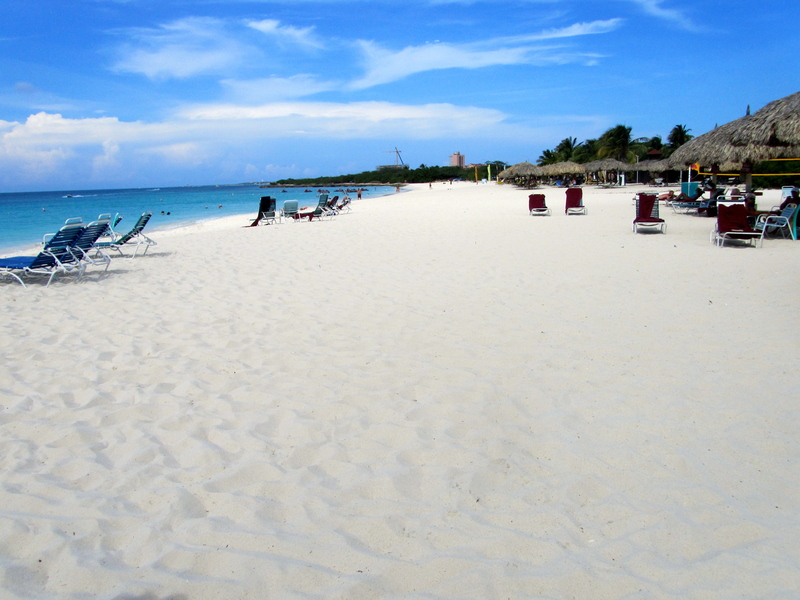 Some activities and beautiful white sugar sand with palm trees, but less people. We like them all.